To this day, Death Note is the only Manga that I have read, and considering how much I love it, I’m surprised that I have not explored more. 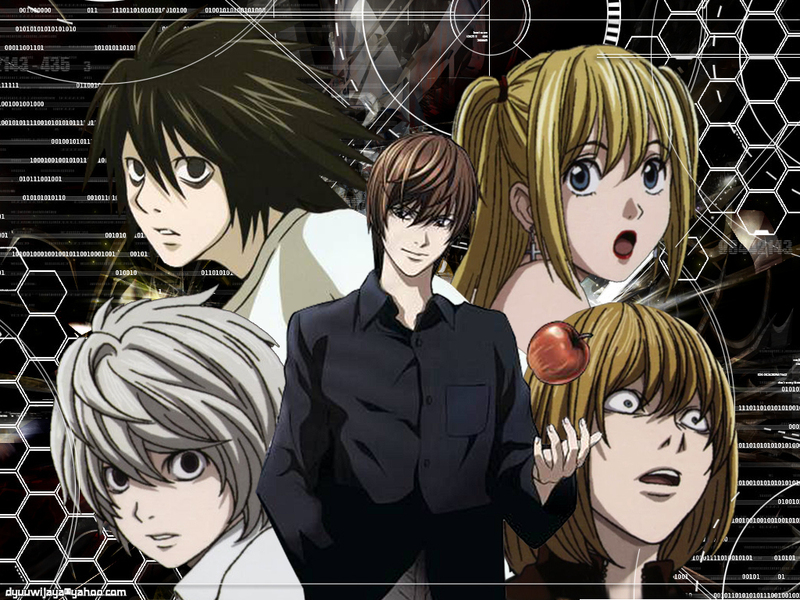 I read Death Note on a recommendation from my old curriculum director, and I was hooked from page one. It’s a fantastic story filled with twists and turns that only amazing story telling can produce. However, this is not my review of the fantastic series. My Man, Myth, Monster class just read the first volume containing the first two books of the series, and Hayden W., in love with the series has completed his first blog review on the title which appears below. Check it out, and check out Death Note! The controversial what if question of “is the death penalty justified” is one that stirs crowds and can vet even the closest of friends against one another in a heated debate. Tsugumi Ohba could not have conveyed the pros and cons of this debate more beautifully than in his critically acclaimed series, Death Note. This review will consist of the series as a whole including important plot details: SPOILER ALERT. To succinctly summarize the story as a whole, the smartest teen in Japan, Light Yagami, finds a book of death called a death note. The note was dropped from the realm of the Shinigami, or Gods of Death. If a name is written in the book, the person will die either of a heart attack or a specified cause within their physical limits. Light Yagami decides to use this book to rid the world of crime and criminals. Of course, there is the obvious irony here that every third grader would notice. Death Note is a masterpiece. It became increasingly popular with the anime adaptation in the U.S. Tsugumi Ohba displays on multiple accounts throughout the series that he is truly a genius—or at least can write like one. The seemingly endless, witty banter between the main protagonist, Light (actually an anti-hero), and antagonist, L, is dialogue that requires even an incredibly talented and experienced reader to reread due to fear of missing something. The ambiguous clues left throughout, the thought provoking insinuations made by characters, and of course, the way the plot thickens as Light’s plan unfolds despite the enormous obstacles he must hurdle demonstrate the wit required in writing the series. Just when it is revealed that one character is about to move in for the kill and the readers are marveling at the complexity of the situation, the other retorts in an even more uncanny way that renders even the re-readers speechless. From the time that Light is depicted as the smartest in Japan for his age, the bar is set very high for what is expected of him: Ohba never fails to go above and beyond. Artistically, Takeshi Obata does a phenomenal job creating each and every character and depicting each scene precisely as one would picture it, should there be no accompanying image. 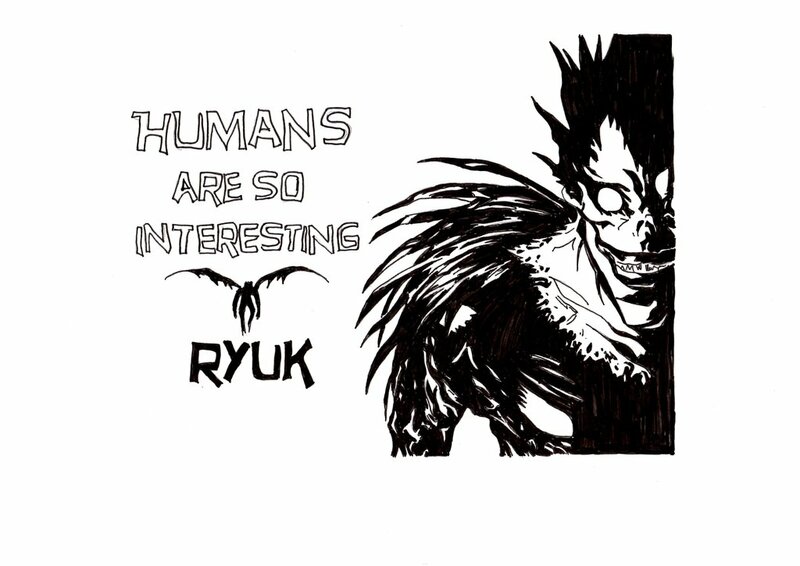 The mannerisms given to each character by Obata, such as L’s peculiar sitting position or Ryuk’s hunch-back, not only justify the text but play off of the text masterfully. The depictions of the false Kira, the Shinigami Realm, and other subtleties like Near’s resemblance to L in a more pure way are those that are impossible to simply overlook. The illustrations command the attention of the readers and draw the eyes to each corner of every frame the way that few other authors may do. There exists only one possible critique: there is no color. The manga is in black and white (which in my professional opinion is justifiable for several reasons I will delve into). Many readers from the late twentieth or twenty-first centuries may be slightly upset by the lack of color which is understandable because of the demand for color in this day and age. The black and white illustrations are so not due to a tight budget, but because of the complexity of the work demanding they be colorless. With color illustrations comes an increased sense of complexity. The color is more likely to draw the readers away from wondering why and what Light is doing at a given point and nudge them toward wondering why he is wearing a green shirt while doing it. Ohba and Obata were more concerned with content than with color, and that is why the manga is in black and white. As far as the anime goes though, it is too difficult to produce a successful show these days that is not in color, so the choice there was an easy one to make. This review may seem heavily biased to some, and I do apologize for that feeling if it persists; however, I assure all readers that this review was as unbiased as any reader or critic could give such a phenomenal work. The series is just too good. I say this not because I personally liked it, or because Shueisha and Viz Media tossed large sums of money my way, but because it really does provide an experience that no other series has since provided me. I would recommend that not only any readers of this review read the series if they have not already, but I recommend that you all recommend the series to a friend because it is that good. If there are any doubters, I leave you with one final statement in the form of a challenge: find someone who read and comprehended the series or watched the anime that doesn’t like it.